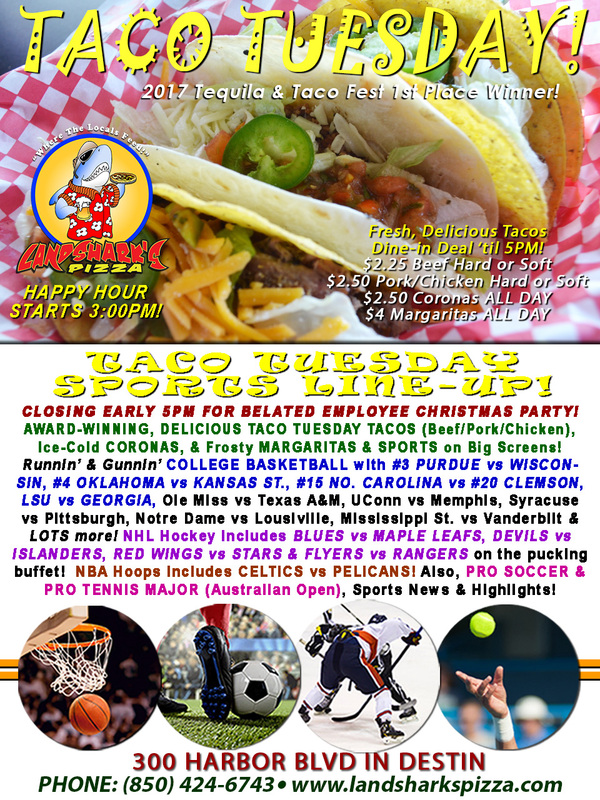 / Best Taco in Destin FL / Taco Tuesday BLAZING-HOT COLLEGE HOOPS Action, NBA, NHL|Taco, Margarita, & Corona Specials! 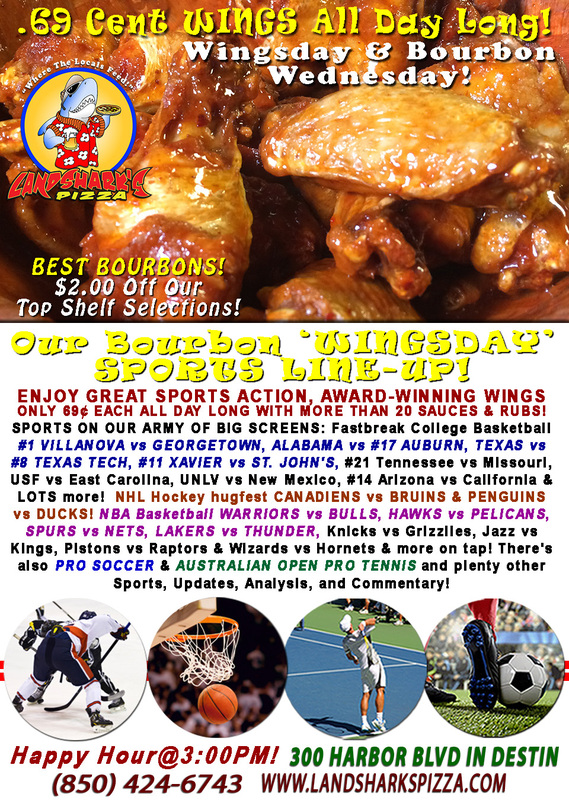 Taco Tuesday BLAZING-HOT COLLEGE HOOPS Action, NBA, NHL|Taco, Margarita, & Corona Specials! 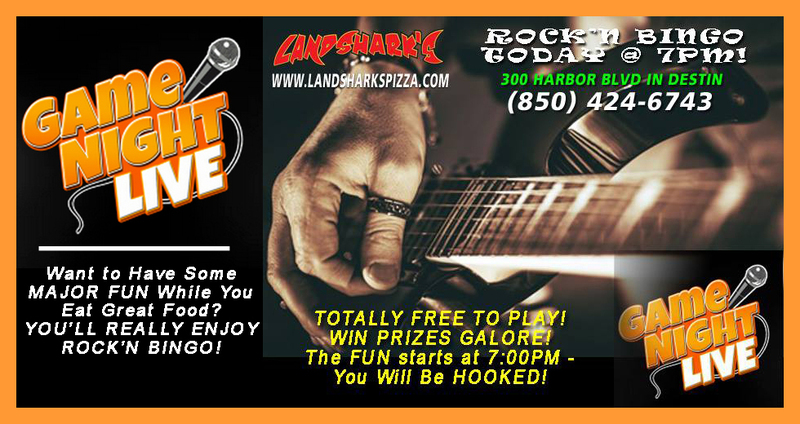 Put some fun in your day with TACO TUESDAY here at Landshark’s Pizza highlighted by ROCK’N BINGO, NCAA Basketball, NHL, NBA & other sports action here at Landshark’s, your sports fest Taco Tuesday headquarters with Taco & Drink specials! (dine-in ’til 5pm with regular drink purchase). Also featuring $2.50 Coronas & $4 House Margaritas! GET YOUR GROOVE THING SHAKING@7:00PM playing ROCK’N BINGO! HOT SPORTS ON OUR ARMY OF BIG SCREENS – COLLEGE BASKETBALL with #3 PURDUE vs WISCONSIN, #4 OKLAHOMA vs KANSAS ST., #15 NO. CAROLINA vs #20 CLEMSON, LSU vs GEORGIA, Ole Miss vs Texas A&M, UConn vs Memphis, Syracuse vs Pittsburgh, Notre Dame vs Lousiville, Mississippi St. vs Vanderbilt & LOTS more! NHL Hockey includes BLUES vs MAPLE LEAFS, DEVILS vs ISLANDERS, RED WINGS vs STARS & FLYERS vs RANGERS on the pucking buffet! NBA Hoops includes CELTICS vs PELICANS! Plus PRO SOCCER & PRO TENNIS MAJOR (Australian Open) coverage and plenty other Sports Broadcasts, Updates, Analysis, and Commentary! 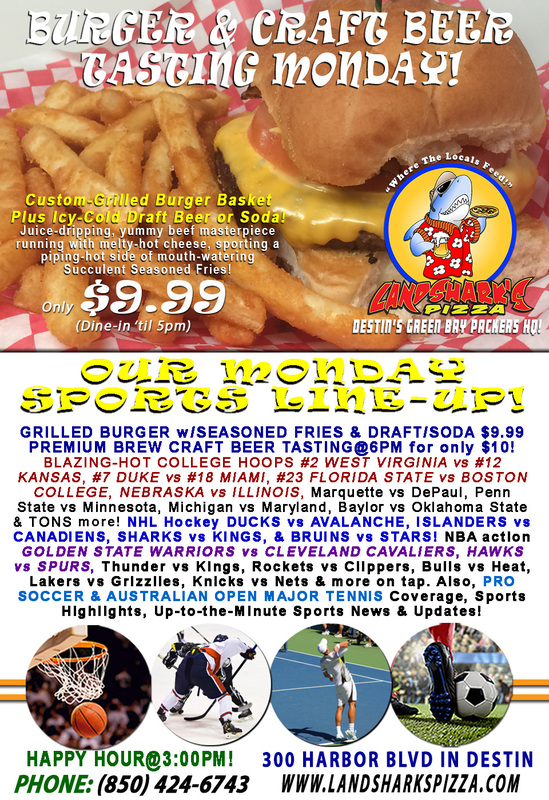 Previous Post: « Steamy-Hot Grilled Burger & Brew Monday College Hoops #2 WEST VIRGINIA vs #12 KANSAS|BEER TASTING@6PM!